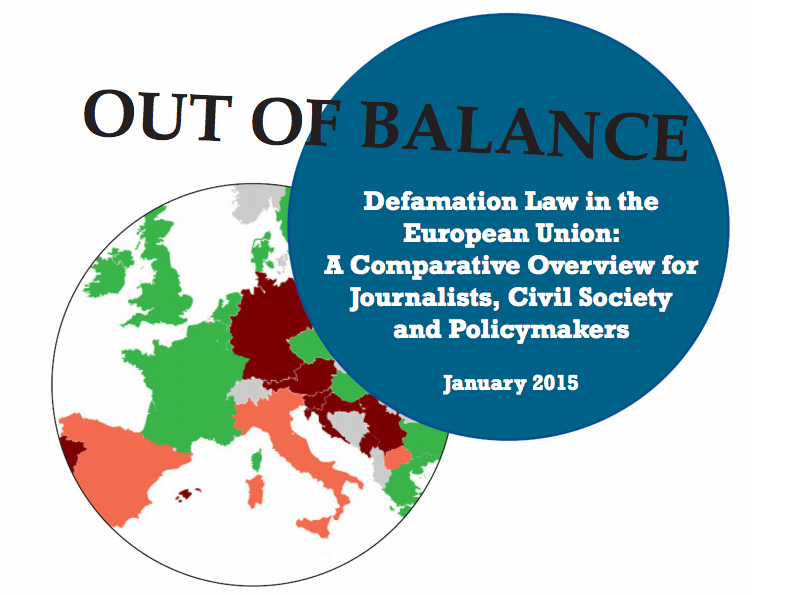 According to “Out of Balance”, the report released today, just five out of 28 EU member states have repealed general criminal defamation and insult laws, despite broad international consensus among legal experts and press freedom advocates that criminal punishments for defamation represent a disproportionate restriction on free expression. The report is based on IPI’s preliminary analysis of data collected by IPI and several research partners. Conducted using a common methodology to examine the existence of legal provisions related to defamation law and practice in the 28 EU member states and in five of the six current EU candidate countries (Albania, which achieved official candidate status last month, is not yet included), the research allows for a comparison of defamation law among EU countries and highlights discrepancies between EU defamation laws and international standards on free expression. Particularly troubling is the report’s suggestion that the EU’s defamation laws, their archaic nature notwithstanding, are not simply collecting dust: according to the research undertaken by IPI and its partners, in the last five years alone courts in at least 14 EU countries sentenced journalists to a criminal punishment for defamation or insult, including fines and even – in the case of Italy – jail terms. Bethel McKenzie stressed that the EU’s defamation laws had to be seen in a global context. Both reports form part of, and offer support for, IPI’s broader advocacy, training and capacity-building work on defamation in the EU, supported with co-funding from the European Commission. This fall, IPI will launch a series of workshops for journalists and lawyers in selected EU member and candidate states to assist journalists in effectively defending their right to report in the public interest. These workshops will be complemented by press freedom missions designed to encourage legal reform based on international standards on free expression. Scott Griffen, IPI Press Freedom Advisor (Project Coordinator), +43.1.512.90.11, sgriffen[at]freemedia.at. Steven M. Ellis, IPI Senior Press Freedom Advisor (Europe and North America), +43.1.512.90.11, sellis[at]freemedia.at.